The folks at Lucky18Casino.com have been watching the jackpot meters very carefully lately. Three of their biggest progressive jackpots – two over a million and one almost a million – have been tempting fate for weeks while a couple of their smaller jackpots ($50K and $11K) are mathematically well overdue for a win. With a total jackpot pool of almost $4 Million, Lucky18Casino.com offers US players the most progressive jackpot money they’ll find anywhere online. 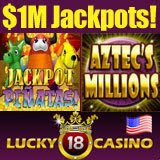 The largest jackpot waiting to be won at Lucky 18 is Jackpot Pinatas which has been over $1.2 Million for a few weeks now. Launched just a year ago with an initial $250,000 prize, Jackpot Pinatas was hit for $273,914 within weeks but hasn’t been won again since then. Aztec Millions (currently $1.1 Million) and Shopping Spree (currently $940K) have never been won so it’s anyone’s guess when they might get their first hit. While there’s millions still waiting to be won, a couple of jackpots have just been won. It’s Good to Be Bad $1 paid more than $151K earlier this month and another player just won $88K playing It’s Good to Be Bad 25ȼ. "Who knows when we’ll have a really big winner. That’s up to Lady Luck herself," said Robert Goldman of Lucky 18 Casino. "We’re amazed at how high our big jackpots have gone. Surely one of the three has got to be won soon! But if you really do the math, our next jackpot win will more likely be Caribbean Stud or Light Speed." Lucky18Casino’s million dollar jackpots may just "feel" like they are due for a hit with no historical data to back it up, but two of their smaller jackpots -- Caribbean Stud Poker and Light Speed -- are statistically overdue for a win. The Caribbean Stud Poker jackpot, currently about $50,000, has been won twenty-three times with an average of fifteen days and six hours between wins. It’s now been nearly thirty days since it was last won making it mathematically long overdue. The Light Speed jackpot was hit 123 days after it was launched. Almost a year later it’s at over $11,000 and overdue for a big win.